2016 was an incredible year in my role as Social Media Manager for FLIR Systems! We have had extremely successful content and are continuing to hit great growth and milestones. 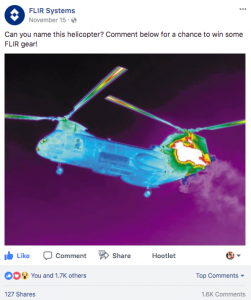 In May, Oregon Business named FLIR a Social Media Superstar: along with great organizations like the Portland Trailblazers and Travel Oregon, an independent panel said that “@FLIR has a good balance of fun feature content.” It was great to see validation from the industry on our efforts! Continuing to partner with networks and channels provides a great opportunity for both content creators and FLIR. 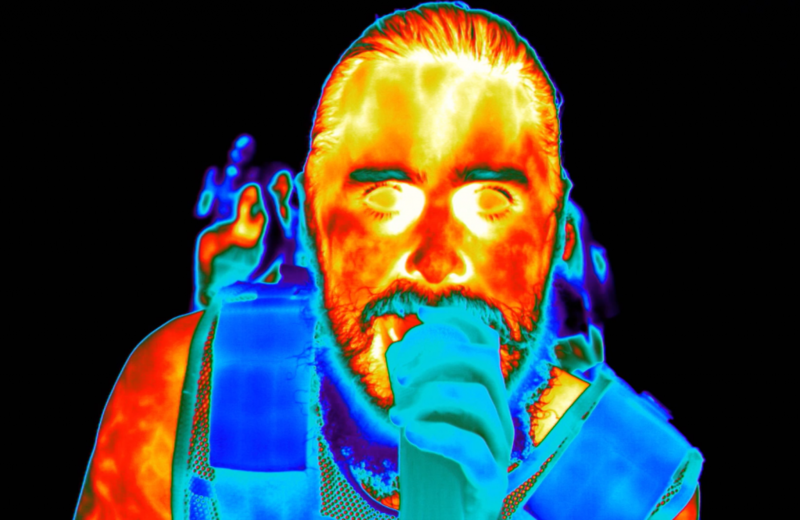 Our technology enables creators to tell stories in exciting new ways, and introduces a whole new audience to the world of infrared. We had some great videos featuring FLIR with Physics Girl, the Hydraulic Press Channel, Red Bull, and more! Our social media reach continues to grow – impressions have risen over 200% since I became Social Media Manager two years ago. We’ve expanded our audience even more in 2016, with a total audience reaching nearly 200K, even more when tying in FLIR’s sub-brands. We see the evidence of reaching critical mass in our daily interactions with customers, whether through the engagement of fans, or individuals reaching out for product recommendations and support. We’ve begun live streaming content in 2016, but our cadence will increase as we move into 2017. Our CES live streams last year were under the radar, but this year we’re promoting our live stream of show activities, and we expect a good turnout! We hope to introduce some regular live streaming segments – and add more personality to FLIR’s social presence (See our Invisible Labs series). As our department grows, so will our ability to continue to produce fun and engaging content, and we strive to have more hits as the year moves on. Where in the World is Vatche? Been a while since I’ve updated! Since April of 2015 I’ve moved into a new role at FLIR as the Social Media Marketing Manager for the company. I manage all of FLIR’s social media brand channels, including Extech and Raymarine. Taking on the role has moved me out west to Portland, Oregon! A long ways from Boston! It’s been an amazing year – ending with bringing FLIR’s total audience on Facebook from 28K to 100K in just a few months. We’ve generated some great content in the second half of 2015 – bringing our total social brand impressions to to over 50 million (around a 1,000% increase Year over Year!). As I settle into the new role, I’m looking to get back into the side projects! It’s been a while since I’ve posted any fun little shorts, so definitely looking to do more, as well as pick back up on some in-progress projects. More to come soon! 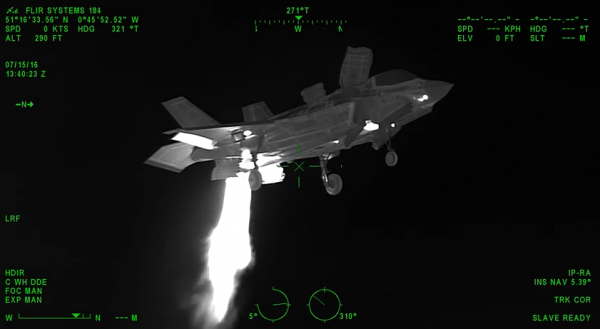 It’s been a whirlwind few months over at FLIR for new Video Content. One of the latest projects I’m really proud of is the 30 second spot I produced, shot, and cut for the new FLIR C2. The main goal was to drive the point home that this was an exciting product, especially from a form factor standpoint. Also – a big event this month was CES. I created wall-to-wall coverage cutting 10 videos during the event that were used on FLIR’s social channels. See some of them below! Been a busy month! Covered the Independent Film Festival of Boston once again for LonelyReviewer.com. We shot a ton of Q&As, some of which can be viewed here. We finished the first season of Boston Open Screen at the Coolidge last night, taking a hiatus for the summer. Also, I just put the finishing touches on something that had gotten lost deep in my vaults, “The Interview,” a little piece I shot back in 2011. Lot’s of good stuff in the works! In testing and familiarizing myself with the Blackmagic, I’m filming little moments/situations/environments with the new 4K camera. This latest short I shot in my Uncle’s small Garage/Workshop. Lit only by two overhead fluorescents, and the first shot in a dark parking lot, the images this camera puts out have a lot of life.